I have been blogging for 6 years now. SIX years. 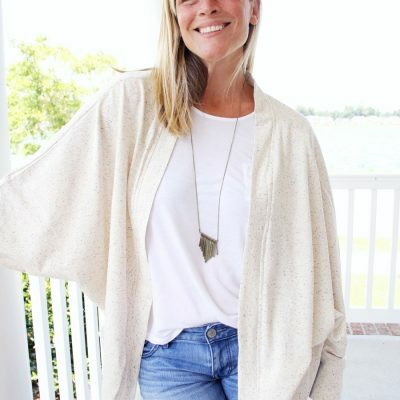 When I first started, I thought I was just going to throw up some things I sewed and start a conversation with random like-minded people about our sewing projects. 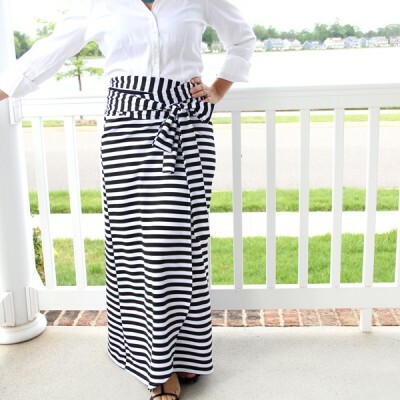 After seeing Rae’s blog, I was totally encouraged and threw up a post in Blogger. Little did I know where that road would take me. I remember I was so excited when I had my first comment from a non-family member. Somebody found me and liked what I did!!! I was hooked. 1,668 posts later…I have made friends and connections that I never dreamed I would. Worked with companies that never seemed possible, and received comments from readers learning how to sew that have made me cry for joy. Sewing and blogging has been a gift from above that saved me, having started in a dark time of my life when I truly just needed a friend. In those 1,668 posts – there are some that truly stick out in my mind. Which is what brings me to today’s post. 5 years ago I received an e-mail from someone asking me to be a part of their blog series. It was the first time someone had reached out to me asking me to be a part of their blog! I was so excited and honored, and I immediately responded affirmatively. I really stretched myself to think of a good post to repay their kindness, and finally decided to try my hand at recovering an umbrella. It was difficult at the time, and had never been done in blog-land (as far as I could tell). And I remember being so excited submitting my guest post. 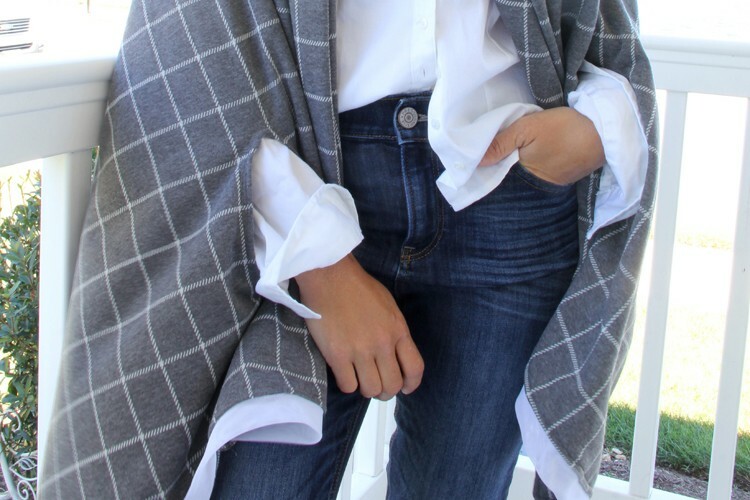 It received rave reviews, and was featured on Craft Gossip. 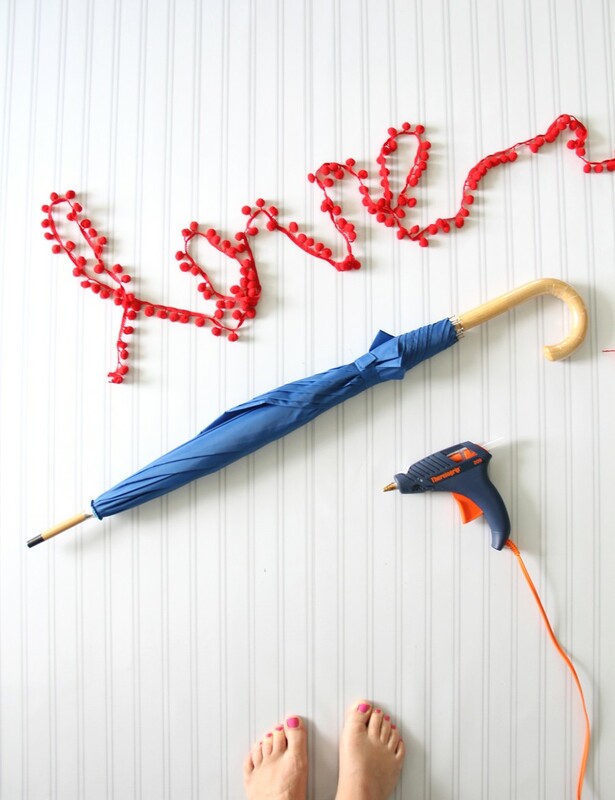 I have never forgotten that post, and have wanted to do something again with umbrellas ever since. 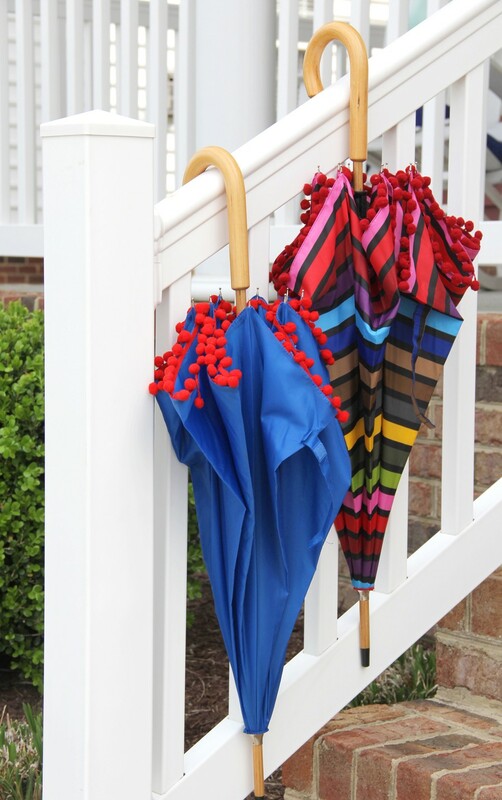 So when I was thinking of ideas for my April Jo-Ann Fabric & Craft Stores blog post…the umbrella idea came to mind. Wanting to do something fun and different, I decided to take an easier approach this time and simply add trim. Pom pom trim to be exact. Because pom poms make everything better :). *3 yards covered a small rain umbrella. 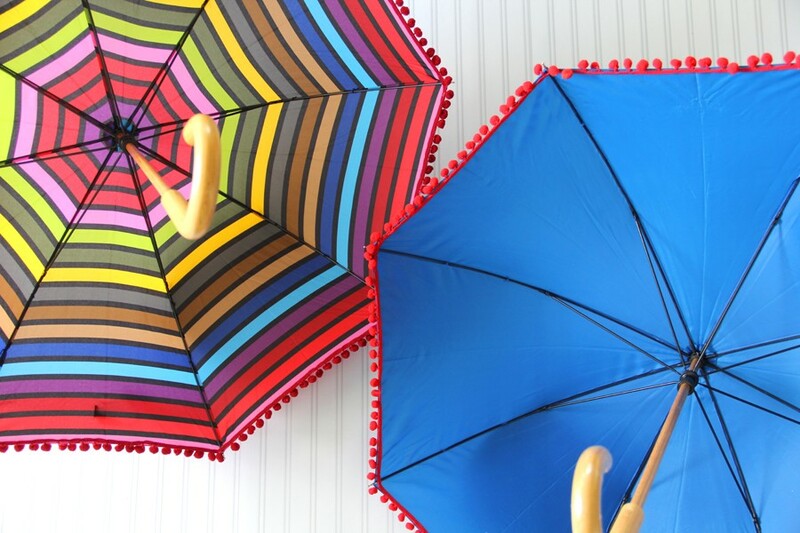 For specific pom trim requirements, measure the outer circumference of your umbrella canopy. Before you start, make sure your pom pom trim is unraveled, and none of the pom poms are tangled. To do so, simply gently unroll the trim. If there are any snags or tangles, simply untwist the poms that are tangled together. 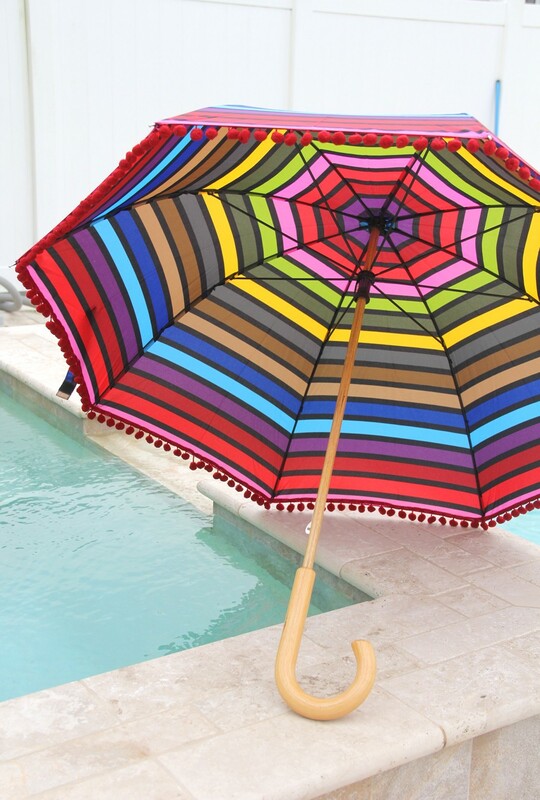 Starting at one umbrella end cap, slip the end of the pom pom trim underneath the edge of the umbrella canopy. 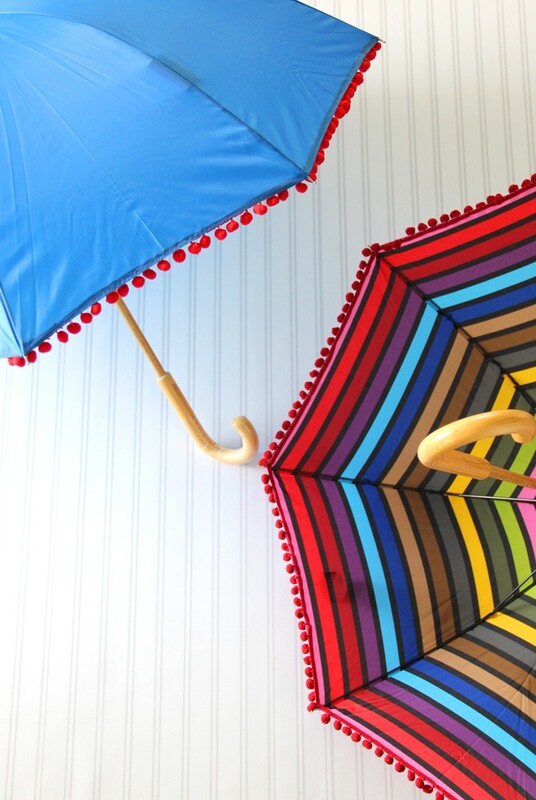 Place a thin line of hot glue along the inner edge of the umbrella canopy, and gently press the pom pom trim to the hot glue. 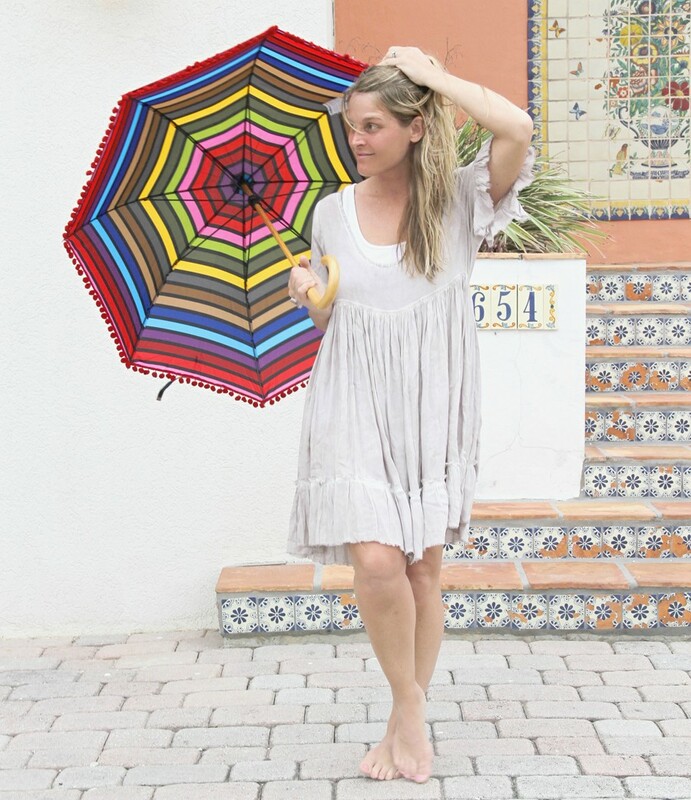 Continue all the way along the outer edge of the umbrella until you reach the starting end cap. Trim pom pom trim to size, overlapping the beginning trim by 1”. 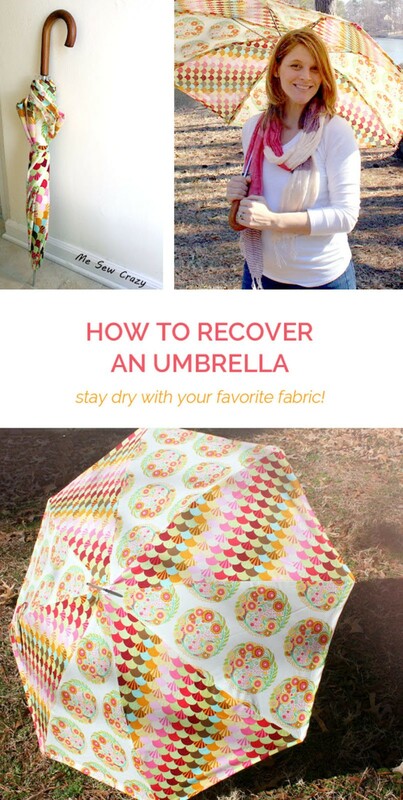 Click HERE to download the instructions for how to recover an umbrella. Now if only I could find that umbrella to take better pictures of the well-loved project. Now THAT would be fun! Unfortunately it has been lost with time. 5 years and 3 kids will do that to you. 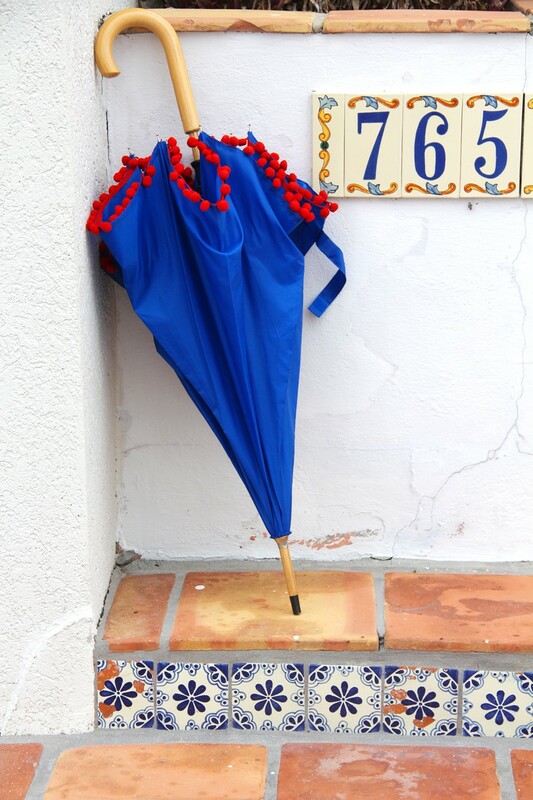 Pom Poms on an umbrella! I totally LOVE it! 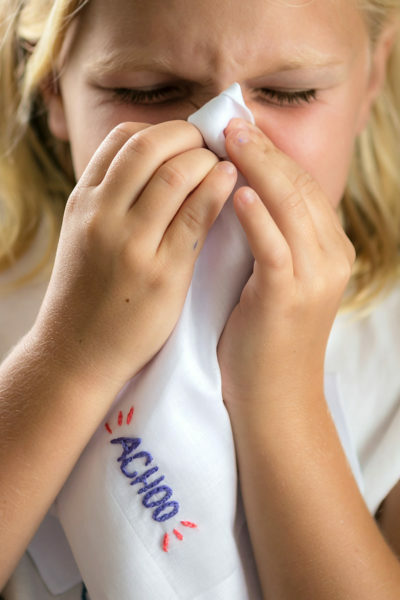 Thanks for sharing a bit about your blogging journey. I think a lot of us who started way back when, had a similar motivation. It’s amazing how you can blink and it’s SIX years later. This is so stinkin’ cute!!! The poms totally make it even better!